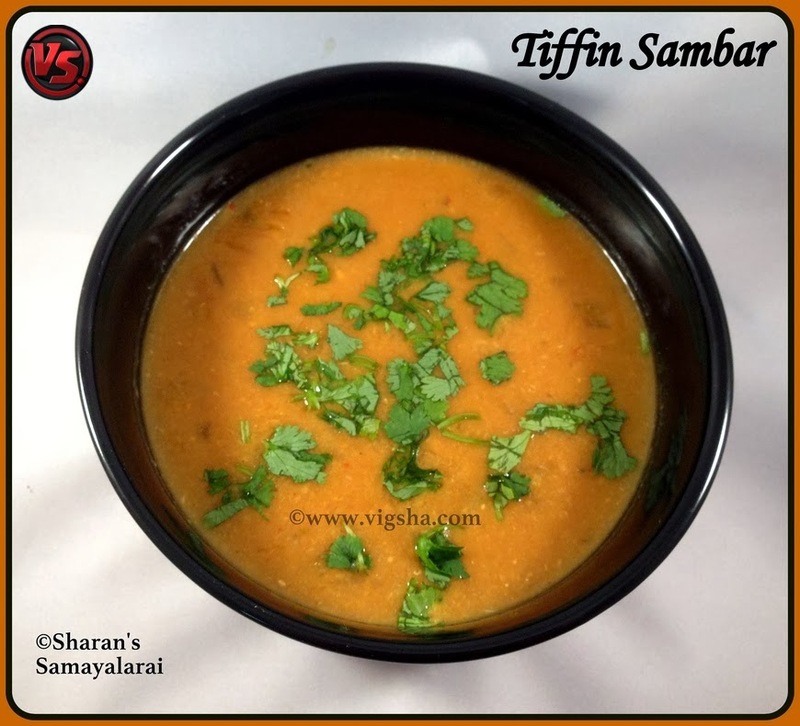 Tiffin Sambar / Hotel Sambar is lentil based veggie stew. This restaurant style Sambar is simple yet tastes delicious with complementing flavors. It is not the regular sambar, as the name indicates it is perfect only for south-Indian breakfast. Sambar plays a major role in making Sambar Idli. I usually prepare Sambar with Toor dal, but this time I wanted to try the recipe which I read in a cooking magazine which calls for Moong dal. I have slightly altered the recipe to suit my taste. Tiffin Sambar is similar to our regular sambar, but the amount of dal and tamarind is reduced and a freshly ground powder is added to give that unique flavor. 1). Wash & soak moong dal in water for 20 minutes. Pressure cook with enough water for 2-3 whistles. Add 1 cup of water and mash with laddle and keep aside. 2). Grind the ingredients under "To grind" to a smooth paste. Add water if needed, keep it aside. 3). Heat oil in a pan, add mustard and let it splutter. Then add onions, hing, green chillies, curry leaves and tomatoes, saute till tomatoes turns mushy. 4). Now add drumstick along with turmeric powder and salt, saute it for 2 minutes. Add the cooked dal and combine well. Then add sambar powder and chilli powder and combine well. 5). Soak tamarind in warm water, discard the seeds and extract the juice. Add this to sambar along with Jaggery. Then add the grounded paste, required water and mix well. Paste will be thick and clump up, use wire whisk and breakdown the lumps. Let it cook for 5-7 mins on low flame. 6). Check for salt and spices. Allow the Sambar to boil until the drumstick gets cooked. Once the gravy consistency is reached switch off the stove and garnish with cilantro. Delicious Sambar is ready to serve hot with idli's for a divine meal. Drizzle some ghee and make it even more heavenly. I bet you will have an extra Idli with this yummy sambar . # I have used onions but shallots or pearl onions suits best for Sambar, it adds more taste. I had none so I didn't use it. # Dry roast moongdal before cooking for good flavor. # I normally keep this sambar simple with just onion, tomatoes and drumstick. You can very well add other veggies too but don't use too many veggies though ! # I have used normal cooking oil, but try using sesame oil to cook or add few drops before serving. # I have read that adding tomatoes while cooking dal gives a nice flavor and different taste.